Wat Phra Kaew or Wat Phra Si Rattana Satsadaram, also known as Emerald Buddha Temple, is an architectural wonder located in Grand Palace. Regarded as the most sacred and the most important Buddhist temple in Thailand, it is a potent religious-political symbol and the safeguard of Thai society. It is shaped by polished orange-and-green roof tiles piercing the sky, encrusted pillars and rich marble pediments. With a total area of over 94.5 hectares (234 acres), Wat Phra Kaeo has a plethora of buildings within the precincts of the Grand Palace. Over 100 buildings with “200 years royal history and architectural experimentation” link to the temple. 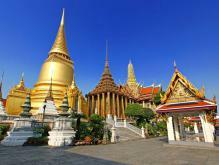 The architectural style is named as Rattanakosin style (old Bangkok style). Emerald Buddha is one of the sacred ornamentations in Wat Phra Kaew. Housed in the main building - central ubosoth, the statue of Emerald Buddha is the temple’s primary attraction, which is about 66 cm and carved from a single jade stone in a standing form, and sits at the top of a high altar, almost invisible among the gilded decorations. Only the Thai King is allowed to touch the statue. Other constructions worth visiting are Murals of Ramakian, Model of Angkor Wat, Hermit statue, nine towers etc.